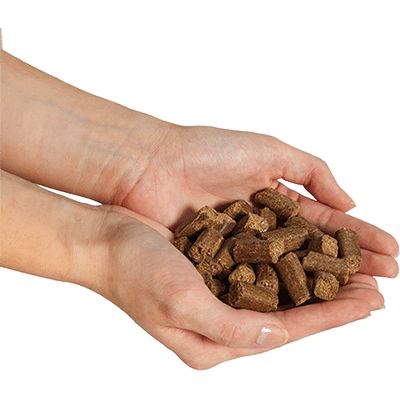 A sample pack of one of our Cold Pressed Dog Food recipes is approximately 200g. 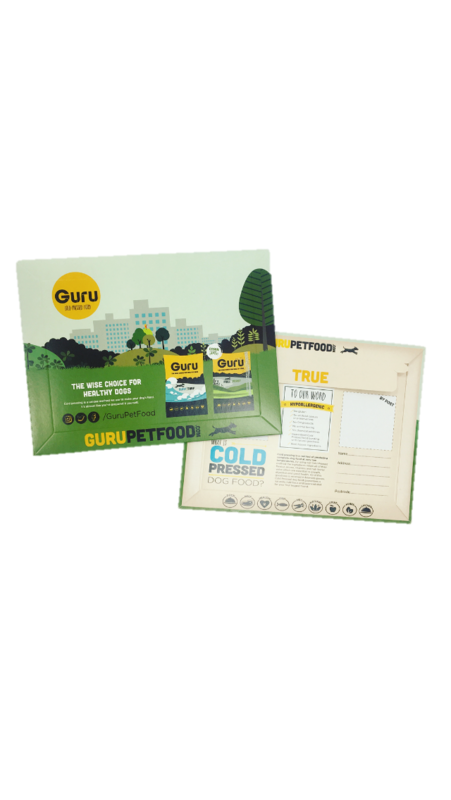 Treat your dog to a sample pack of our tasty Guru pet food. This delicious sample is sent out 1st class and will be popped through your letter box. The sample includes 200g of cold pressed dog food made from natural ingredients that we’re sure your dog will love. Our cold pressed method means that your dog will be enjoying food that’s packed full of flavour! Not only is Guru cold pressed dog food a complete dried meal, it’s also suitable to feed alongside a raw diet. We’re sure your dog will love every bit of our gurulicious bite sized pieces! See how quickly your dog enjoys our sample pack, and why not try our Full On Feast range or larger Surf & Turf packs? All of our ingredients are subject to strict inspection and approval before they are made into the terrifically tasty bites your dog deserves. Once approved, (shhh, here’s the secret bit) the ingredients are gently mixed at low temperatures then pressed using a specially designed process. The very low temperatures allow these tasty bites to retain all of their natural, nutritious goodness. Dried Ground Beef (30%), Brown Whole Grain Rice (thermally pre-treated), (29%), Dried Ground Sea Fish (7%), Sweet Potato (7%), Dried Poultry Liver, Maize Germs, Mixed Vegetables (alfalfa, broccoli, carrots and chicory), Mixture of Cold Pressed Vegetable Oils (evening primrose, linseed & rapeseed), Seaweed (dried), Beet Pulp, Fish Oil (4%), Gelatine Powder, Dried Moor, Dried Fruits (apples, cranberries, pears), Dried Herbs (green tea, parsley & rosemary) Yucca Schidigera (dried), Garlic Powder, Pre Biotic (FOS, MOS), Dried Green Lipped Mussels. Dried Ground Chicken 27%, Brown Rice (thermally pre-treated) 26%, Dried Ground White Fish 6%, Sweet Potato, Potato, Peas, Cold Pressed oils (rapeseed & linseed), Chicory Pulp, Apple, Broad Beans, Alfalfa, Blackcurrant, Carrot, Gelatine, MOS, FOS, Glucosamine, Yucca, Green Lipped Mussels, Parsley, Rosemary, Green Tea Extract, Chondroitin.